The thing about house renovations is this: some parts are fun and some parts are not-so-fun (I suppose that's the thing about life in general, huh?). But all the parts are necessary, or at least worth it, so you push through the not-so-fun parts anyway. The little details really do make all the difference, too. Sometimes they're tedious and time-consuming and unenjoyable, but the end result fuels the process and makes it all worth it in the end. My beautiful sink and window. Painting! LOTS and LOTS of painting! That's what we've been up to lately. Painting trim and baseboard and crown moulding. Painting backslashes and cabinets and walls. Never-ending painting. And then, of course, after the painting, my husband had to hang it all. The cabinets are something I love as well! They have breadboard inside them, but they didn't come that way. We bought unpainted, wooden cabinets with flat doors from Menards. I mentioned liking breadboard cabinet doors to my husband, and he went and bought breadboard and cut and attached it all. It was a tedious job, but it's a detail that makes a big difference! As I look at pictures of houses, I've noticed that lighting makes a huge difference in decorating a room. I love eclectic lighting... where they are all unique but fit together somehow. I love the light we chose for above our sink (and the vintage light bulb makes a huge difference!)... 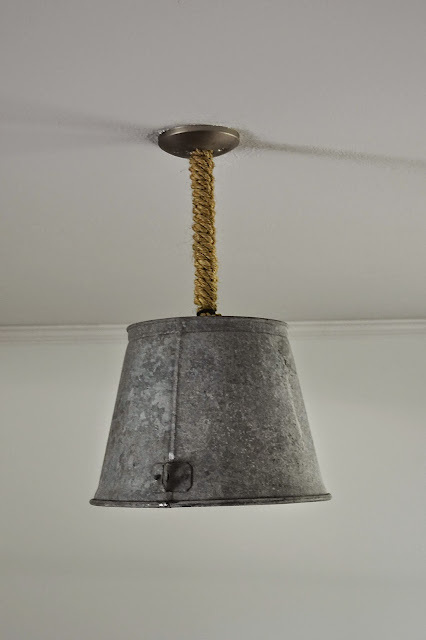 and I really love this galvanized bucket we turned into a light! I had the idea, and Ben picked up the bucket at an antique store and poked holes in it. I tied rope around it, and then Ben hung it. It's hanging in our living room, and I'm so excited for the rest of this room to come together. Right now, the bucket light is pretty much the only cool thing in it. I've also been working on some paintings to hang in our house. Here's a sneak peak of the latest one I finished. Can't wait to share the whole thing and what room we hang it in! 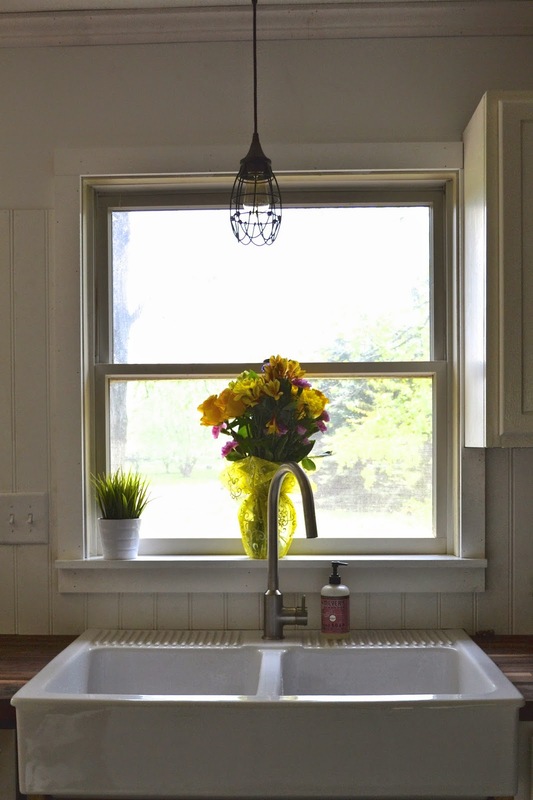 And one more picture of the baby bathing in the farmhouse sink because it's just too much beauty not to share! Make sure you check back to see more of the details coming in the (hopefully not too far-out) future! Jessica!!! I think about you all the time, girl- so good to hear from you! We need to catch up about how this semester went for you! Love you!